Rewriting and other things I hate… | Damian Trasler's Secret Blog - Do Not Read! Fake notes, but a real project...Shelved, for now. Writing is the main part of the job, obviously. Without doing the writing bit, you don’t get any of the other parts of the glamourous life of being a writer. But reading the inspirational blog of Mr James Moran again the other day, I was reminded that rewriting is key to being a good writer. Mr Moran got his big break when his script “Severance” was made into a movie. (Actually, there were a number of things that he acheived before then, but I’m abbreviating. Read his blog FAQ’s for the full and fascinating story) But before it got accepted and filmed he wrote twenty drafts. Twenty. And bear in mind that, even if you’re economical with your words, a screenplay for a full length movie tops a hundred pages. Two thousand pages to produce one workable movie script? The longest Harry Potter novel was less than eight hundred pages. Rewriting was not something I used to do. 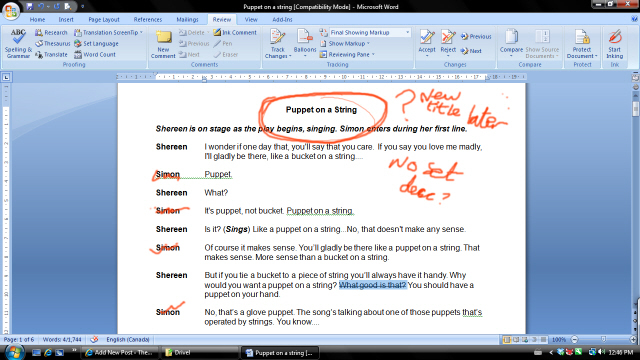 I began my playwriting with short plays and one acts, and they usually came out the way I wanted them. There were some where things didn’t sound right, or there were ideas I hadn’t managed to include, but going back over the text, I couldn’t see where to cut or insert anything. I think I was afraid that if I pulled at what I’d got, it would all unravel. 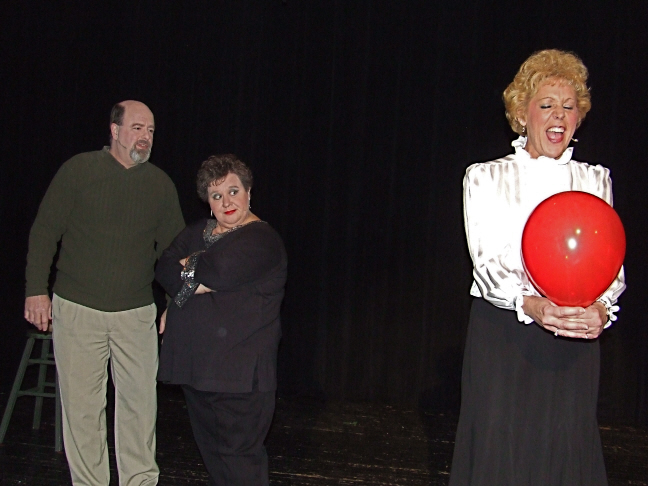 Then I wrote a short play called “The Red Balloon” which is still one of my favourites. It started with the voices in my head, like a lot of them do, and very quickly became part of a nice idea – what if the stupid, pointless modern art piece at the beginning gave way to a piece of melodrama, then that gets refined, over and over until someone takes the process too far and we ended up with the stupid piece the play starts with? Sorry if I just wrecked it for you. Read it anyway, there are some laughs in it. This was ambitious – I had never begun a play before with a specific end in mind, and I wasn’t sure how I would manipulate the characters to get the ending I wanted. I showed Mrs Dim the completed play and she hummed and hawed over it. It was, she said, OK. But wouldn’t it be better if this happened, and that, and then you could do this…? She was right, and since I liked the original idea so much, I was loathe to send the play off to the publisher when I knew it could be better. I took a deep breath and went back into the text. It was amazing, making small changes without the whole fabric changing too. Some small additions early on allowed the finale to be more logical, less of a leap, and still part of the overall gag. This is the only play of mine that I have seen performed without being involved in the production. One of the most frequently offered pieces of advice about rewriting is to leave it. Don’t get to the end of your book, screenplay or play and then turn back to page one with your red pen. Put it in a drawer, back it up to the hard drive, nail it to the shed, whatever, and DO SOMETHING DIFFERENT. I don’t mean repointing the chimney (though mine needs doing, if you’re keen…) I mean start a different writing project. Jump into that one with both feet and resist the urge to check on your previous baby until you’re done. Then you come back to your old story with fresh eyes. It’ll feel weird to read it, but it’ll be easier to spot the parts that need work, and easier to make those changes because you’re not as invested in the writing now. So, I’ve dug out “Tribute”, a screenplay Steve is desperately trying to adapt for the stage and added some more pages to that. I’m aiming to have the whole thing done by the end of December and then I’m sending it off to Lucy Hay for her usual insightful analysis. When it’s winging it’s way through cyberspace, I’ll go back to Blank Stage Blues and the very first thing I’ll do is think of a decent title…. This entry was posted in Uncategorized, Writing and tagged Harry Potter, James Moran, Lucy V Hay, MACT, Mexico Area Community Theatre, playwright, Red Balloon, rewriting, screepnplay, Severance, Tribute, writing. Bookmark the permalink.